Senior Jordin Canada set the UCLA record for career assists while leading No. 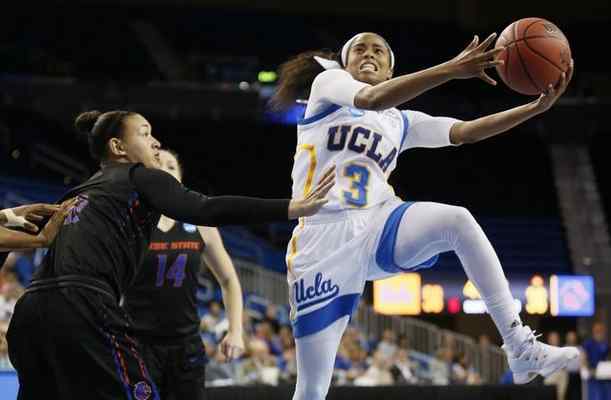 14 UCLA to a 93-55 win over Colorado in Boulder on Sunday as the point guard tallied 10 points and 11 assists. Her 700 assists surpassed former Bruin Erica Gomez‘s (corrected) record of 697, and Canada is the first player in Pac-12 women’s basketball history to record 1,800 career points and 700 assists. The Bruins (13-4, 4-2 Pac-12) jumped out to a 16-0 lead against the Buffaloes and never looked back as the lead ballooned to as many as 41. Japreece Dean had a career-high 21 points with five 3-pointers. Canada had only one turnover with her double-double as UCLA had six double-digit scorers and 13 steals. The Bruins secured their first road sweep of the Pac-12 season with Friday’s 81-74 win over Utah. Click the photo above or (HERE) to see photos of No. 5 UCLA’s 78-60 loss to No. 1 Connecticut at Pauley Pavilion on Tuesday. After practice Wednesday, UCLA women’s basketball head coach Cori Close said her team’s offense looked chaotic and purposeless at times. 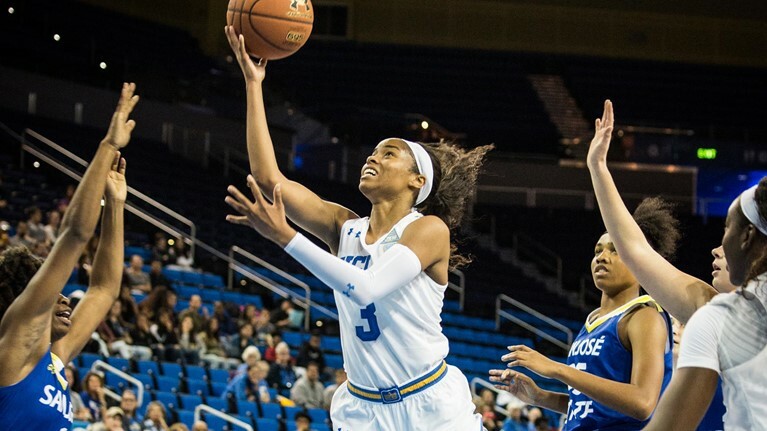 Two days later, that same offense scored a school-record 129 points in its season opener, crushing San Jose State 129-69 at Pauley Pavilion on Friday. Senior guard Jordin Canada notched the seventh triple-double in school history with 26 points (on 10-for-12 shooting), 11 steals and 10 assists. But the reigning Pac-12 Defensive Player of the Year was left wanting more. The Bruins broke a 46-year school record with their 129 points, eclipsing the old mark of 125 points set in 1971 and matched in 1976. UCLA was 47-for-83 shooting with 27 free throws off 38 attempts. Canada and Meyers, now known as Ann Meyers-Drysdale, are the only two UCLA players with two triple-doubles in their careers. Canada is the only player in school history with a points-assists-steals triple-double. 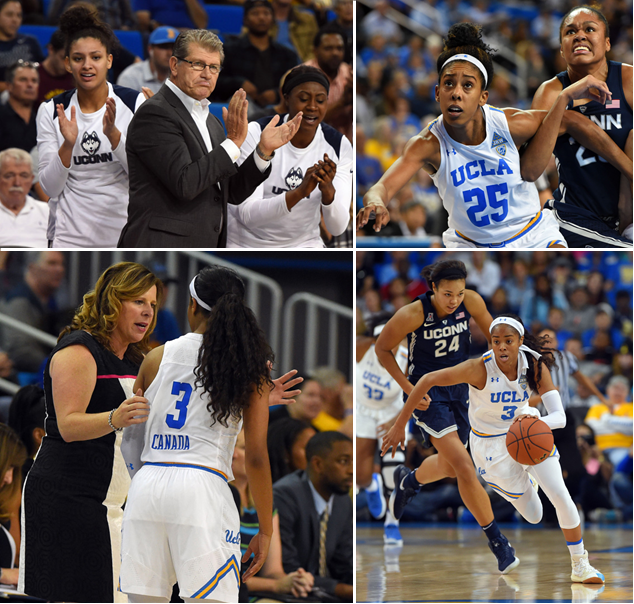 With four starters returning from last year’s Sweet 16 team, the UCLA women’s basketball team was picked to win the Pac-12 in the preseason coaches poll, the conference announced Wednesday. The Bruins are coming off back-to-back Sweet 16 appearances for the first time in school history. They received 115 points and seven first-place votes to lead the coaches poll. UCLA was also picked to win the conference last year, but finished fourth. Senior guard Jordin Canada led the conference in assists (7.12) and steals (2.5) last year. The L.A. native was third in the Pac-12 in scoring with 17.8 points per game. She was named the Pac-12 Defensive Player of the Year and earned All-Pac-12 and All-Pac-12 Defensive Team honors for the second straight year. Senior forward Monique Billings was named All-Pac-12 and All-Pac-12 Defensive Team after starting all 34 games for the Bruins. He was the second-leading rebounder in the conference with 10.5 boards per game.